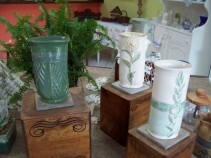 Hand built ceramic pottery by Jo Ackerman. Each piece uniquely designed with detailed embellishments and glazes. 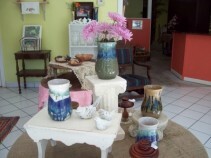 Hand thrown pottery from local artist Debbie Dowdy. Variety of sizes and glazes available. Price does NOT include flowers. Call for available selection and pricing. 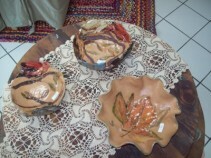 Hand built bowl and vases by local artist Donna Voll. She is known for her birds and angel vases, bowls and wall art. Prices do NOT include flowers. 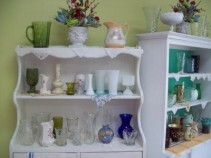 Vintage vases! For those who love antiques, the perfect vase to send flowers in. Call for selection and pricing. Flowers NOT included in price. 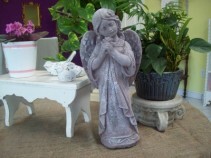 Weather hardy, cement garden angel a perfect memorial tribute gift. Favorite of gardener's as accent among their flower garden. Call for different sizes and styles. Garden Tribute stepping stone. Cast cement stones with inscriptions of comfort phrases. Comes with steel display easel can be used with stand in garden or as stepping stone. Send alone or with plant. Call for selection. 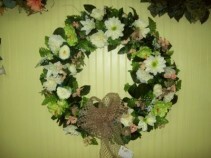 Silk wreath for memorial. Comes with easel for display at funeral. Available in assorted colors. Call for selection and pricing. Flowers convey a message that cannot be put into words. 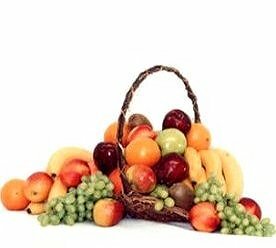 Artistic Florist of Cleveland, GA provides a variety of fresh, fashionable floral designs to ensure that your gift is one of elegance and beauty. When you're looking for a unique hostess gift, token of appreciation or just a surprise to brighten someone's day, let Artistic Florist customize and deliver one of our many fun, decorative & luxury gifts! We create dazzling presentations that are sure to please for any gift-giving occasion. To get your custom gift items, come by and see Artistic Florist - your local Cleveland, GA florist.